In 2009 an ambitious group of graduate students led the Scripps Environmental Accumulation of Plastic Expedition (SEAPLEX) to the North Pacific Ocean Subtropical Gyre aboard the Scripps research vessel New Horizon. During the voyage the researchers, who concentrated their studies a thousand miles west of California, documented an alarming amount of human-generated trash, mostly broken down bits of plastic the size of a fingernail floating across thousands of miles of open ocean. At the time the researchers didn’t have a clear idea of how such trash might be impacting the ocean environment, but a new study published in the May 9 online issue of the journal Biology Letters reveals that plastic debris in the area popularly known as the “Great Pacific Garbage Patch” has increased by 100 times over in the past 40 years, leading to changes in the natural habitat of animals such as the marine insect Halobates sericeus. These “sea skaters” or “water striders”-relatives of pond water skaters-inhabit water surfaces and lay their eggs on flotsam (floating objects). 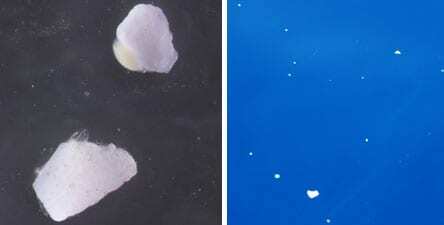 Naturally existing surfaces for their eggs include, for example: seashells, seabird feathers, tar lumps and pumice. In the new study researchers found that sea skaters have exploited the influx of plastic garbage as new surfaces for their eggs. This has led to a rise in the insect’s egg densities in the North Pacific Subtropical Gyre. Such an increase, documented for the first time in a marine invertebrate (animal without a backbone) in the open ocean, may have consequences for animals across the marine food web, such as crabs that prey on sea skaters and their eggs. 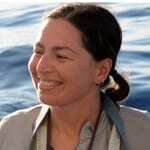 Miriam Goldstein of Scripps Oceanography. Photo credit: Chang Shu. The new study follows a report published last year by Scripps researchers in the journal Marine Ecology Progress Series showing that nine percent of the fish collected during SEAPLEX contained plastic waste in their stomachs. That study estimated that fish in the intermediate ocean depths of the North Pacific Ocean ingest plastic at a rate of roughly 12,000 to 24,000 tons per year. In April, researchers with the Instituto Oceanográfico in Brazil published a report that eggs of Halobates micans, another species of sea skater, were found on many plastic bits in the South Atlantic off Brazil. Coauthors of the study include Marci Rosenberg, a student at UCLA, and Scripps Research Biologist Emeritus Lanna Cheng. Funding for SEAPLEX was provided by the University of California Ship Funds, an innovative program that allows a new generation of scientists to gain valuable scientific training at sea, Project Kaisei/Ocean Voyages Institute, the Association for Women in Science-San Diego and the National Science Foundation’s (NSF) Integrative Graduate Education and Research Traineeship program. The NOAA Okeanos Explorer Program (2010 Always Exploring expedition) and National Marine Fisheries Service provided support for the 2010 samples. Other study support was provided by Jim and Kris McMillan, Jeffrey and Marcy Krinsk, Lyn and Norman Lear, Ellis Wyer and an anonymous donor. Other support was provided by the California Current Ecosystem (CCE) program, part of NSF’s Long-Term Ecological Research (LTER) program. Read the full article at the Scripps Institution of Oceanography. A new documentary about water and all his precious value for all of us. Don’t forget to watch it. Developed, financed and executive produced by Participant Media, the company responsible for AN INCONVENIENT TRUTH, FOOD, INC. and WAITING FOR “SUPERMAN”, LAST CALL AT THE OASIS presents a powerful argument for why the global water crisis will be the central issue facing our world this century. Illuminating the vital role water plays in our lives, exposing the defects in the current system and depicting communities already struggling with its ill-effects, the film features activist Erin Brockovich and such distinguished experts as Peter Gleick, Alex Prud’homme, Jay Famiglietti and Robert Glennon.